Our Sales and Marketing Company plays a major role in setting the average selling price of the project. This is done in parallel with the financials of the project based on the market’s data and requirements. After that, and months before the launching of the project, our company sets the marketing strategy with experts in the advertising field. Finally, the sales process is handled professionally from contract signature till delivery and registration of the apartment. Our scope of work includes following up with clients through several and important milestones throughout the project, following up on payments through our recovery unit and delivering a neat and snag list free apartment to the client. In platinum Invest Holding, we study each opportunity as an individual entity and brainstorm about the concept that can be created through it. It all starts with an attractive plot in Lebanon mainly or any emerging potential country. Whether commercial or residential, in every project we implement many added values and thus differentiate ourselves from the market. We are market oriented and driven by people’s requirements that’s why we seek answers to the existing and future needs. When the concept is ready we study its implementation on ground with our team of designers. needed. Our specialized team is present throughout the process in order to advise concerning the opportunities, risks, threats and also the techniques for optimizing these investments and their profitability. We tend to create trendy and attractive designs depending on our target audience. The designs in general reflect our young flair and modern style. Our main concern is to stay echo friendly and implement green projects. Our designs are done internally by our architectural subsidiary Platinum Design. Our company seeks to provide the best service in this field from the earliest stages of a project till its end by controlling its time cost and quality. The work starts by following up on the design development through the pre-construction phase. Choices of contractors or subcontractors, and recommendations to the owners and investors, are also within the scope of work of our construction management company. 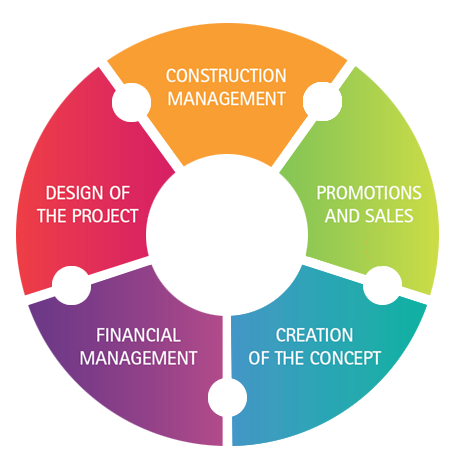 From specifying project objectives and plans, budgeting and scheduling, to maximizing the resource efficiency through procurement of labor, materials and equipment, our company aims to assign the best suitable team for the project and develop effective communications and mechanisms in order to hand over the most effective reporting throughout the process.